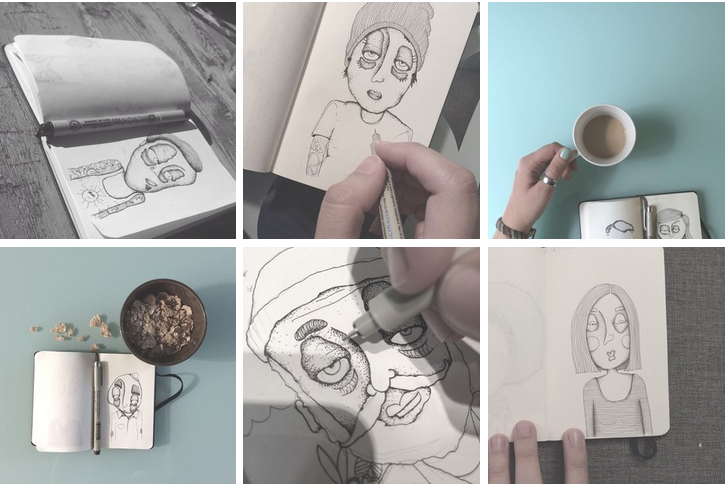 Since July 7th 2014, Michelle Khalil has been sketching a personality (almost) every single day. I came a cross her project profile on Instagram and was largely attracted by the captions to her daily sketches. The sketches alone are incredibly characteristic, but the captions are hilariously specific - telling little mundane facts about every character. Why does it matter that Yacine likes to clean his keyboard with a Q-Tip? Because somehow, it leads you to believe that you've always known Yacine. It's a 365 day project, and Michelle's 142 days in. If that doesn't scream commitment, I don't know what does. B: How did the project start? Michelle Khalil: It honestly started with me realizing that I was lacking determination and dedication. Once you graduate from university, setting your own goals, deadlines and consequences can be hard. I needed something to help me exercise my willpower and this is when I decided to start the 365 days project. I had started sketching these characters for fun a little while before the project, they amused me and also noticed that they amused others. So, 365 Days Of Personalities or “شخصيات" quickly came up as an idea. Day 126: Tante Aliah talks talks talks and talks. She knows everything about everybody in her surrounding and she will blab about it all. Day 134: Barbar - عمو بربر had a lazy Sunday. That's the best kind of Sunday. Is each personality a spur-of-the-moment illustration, or do you plot it before bed? These are very much a spur-of-the-moment illustrations. I start with the shape of the head, and everything else just comes up as I go along. How many nationalities are the personalities made up of, approximately? Up until now, I’m going to say there are about 21 nationalities and still counting. Day 116: Nada is a very talented painter. She mostly uses oil paint and her favorite subject to paint are her two cats Mac and Chize. Many 365-day projects are doomed by the first week. What's the secret to keep going? It’s not a big secret really, you just have to keep reminding yourself why you started the project in the first place. Getting encouragement from people who follow you is also a big part of the motivation. How about the secret to that perfect caption? Day 115: Mélanie doesn't like French Madeleines. My favourite ones are the ones that people can relate to in a way or another. On Instagram people started tagging others on characters that seemed familiar, I love that. Day 102: Yacine is a poet on his pastime. He likes to carefully clean his keyboard with a Q-tip when he brainstorms for ideas. How will you say goodbye come July 7th 2015? I grew very attached to this project, I’m already thinking about the end. I have a couple of project ideas that I think would be a nice continuation to 365 Days Of Personalities. Stay tuned! 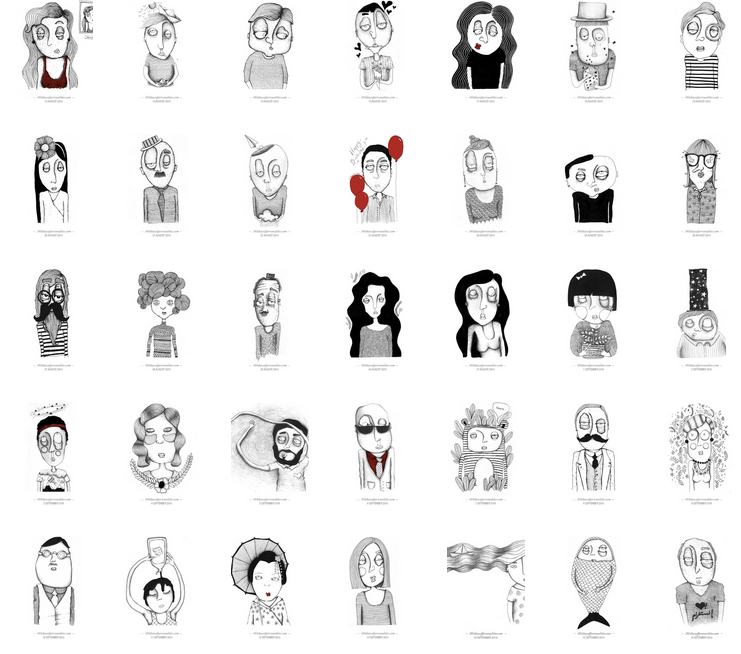 For more, check out 365daysofpersonalities.com- a very fluid, comfortable, and reader-friendly website to say the least. Follow 365 Days of Personalities on Instagram.